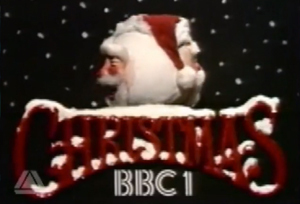 Stretching the definition of “moment” a bit, because this made several outings over a three-day period, but the BBC1 Christmas ident for 1977 has taken on mythical qualities over the years. 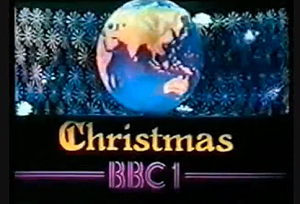 Christmas idents seemed really special in those days because unlike now, when they’re on our screens for anything up to a month, they were strictly rationed to three days and for the other 362 days of the year you had the same globe, unlike today’s myriad variations on the channel’s identity. Given they all needed to have some kind of revolving element the Beeb technicians showed immense imagination and this simple concept is surely one of the most eye-catching and appealing of them all. 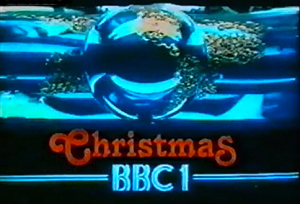 The added frisson of nostalgia comes from that classic 1977 schedule, including the Greatest Light Entertainment Line-Up In The History Of British Television with the Generatio n Game, Mike Yarwood and Morecambe and Wise, all watched by millions of people and emphasising how Christmas was a BBC tradition. 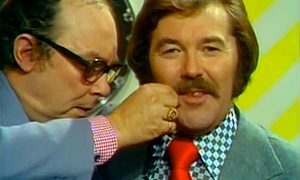 But it was also the end of an era because next year Brucie, Eric and Ern had all defected to ITV and things were never the same again. 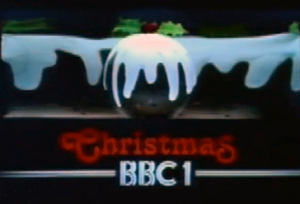 Christmas 1977 remains the perfect Christmas for many and the pudding played it part, illustrating the whole of the Beeb working flat out to bring festive cheer to the audience. And it was a million times better than the following year’s rotating Santa’s head which was just terrifying.